Camp Odayin would not exist without the generosity of the amazing people who donate their time! Throughout the year, we are joined by exceptional volunteers to support and guide our campers as volunteer nurses, camp counselors and cardiologists at camp. We welcome volunteer staff at Winter Camp in February, Residential Camp in July, Day Camp in August and Family Camp in October and November. Camp volunteers must be at least 21 years old. In order to foster independence, we do not permit family members of Odayin campers to volunteer during a camp session when their relative will be a camper. We welcome family members of campers to apply and attend during a different session. Please email us for information or to be added to our mailing list to receive information about volunteer opportunities. Our Summer Residential Camps in Minnesota and Wisconsin and Day Camp in Minnesota are staffed with volunteer camp counselors, nurses and cardiologists. 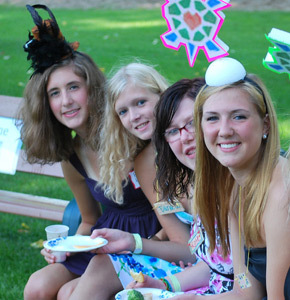 Counselor applications are due May 1st for Minnesota camps and June 1st for our Wisconsin camp. Acceptance information is provided approximately three weeks after the application deadline. Nurses and cardiologists are accepted on a rolling basis, so early applications increase the probability of available medical staff positions. Staff are required to attend the Staff Training in Bloomington, MN from 2:00-6:00 pm on the Sunday prior to their session. Transportation is provided from the hotel in Bloomington, to camp in Crosslake, MN. Staff are required to attend the Staff Training at Camp Lutherdale in Elkhorn, WI from 3:00-8:00 pm on Sunday, July 28th. We will spend the night at camp and then bus out to registration sites in Chicago and Milwaukee Monday morning to pick up campers. If sleeping at camp on Sunday night does not fit in your schedule, we can accommodate. Staff are required to attend the Staff Training at Dodge Nature Center in West St. Paul, MN from 3:30 to 5:30 on Sunday, August 4th. Winter Camp applications are available in early December and all volunteer positions are filled on a rolling basis. Volunteer and camper transportation is provided to/from camp from both Bloomington, MN and Madison, WI. Please email us for information or to be added to our email list to receive a Winter Camp application. There are transportation funds available to accepted staff members, please contact matt@campodayin.org to inquire!